Just because everyone else is doing it, doesn't mean it's a good idea for you. Learn to tune out outside preasures and make good decisions for your business in the long term. In this course, we're going to learn to illustrate a venue two ways: the hard way, and the easy way. We'll be learning one and two point perspective and learn how to illustrate a building the old fashioned way: with pencil, paper, ruler and eraser. Although this is the time consuming route, it's always important to know the technique before you learn the shortcut. During the second half of the course, we'll learn to do it the quick and dirty way so you can spend less time illustrating and more time creating. I'm all about working as efficiently as possible and getting work done as quickly as possible while still maintaining the integrity of the work. Sometimes, this means creating and accepting shortcuts. I have zero shame in utilizing these shortcuts, but the best way to learn a shortcut is to make sure you understand the long way first. Semester III - Open For Registration!! We're so excited to open up registration for Semester III courses! We also have our past two semesters available for registration so you can get started from the beginning! use coupon code 'early20' for 20% off all courses, including the class passes! we'll only be offering the 20% off through September 4th, don't miss out!! Who doesn't love botanicals?? Timeless and classy no matter the medium, we love incorporating botanical artwork into our work and our office space (have you seen our temporary wall mural?). Traditionally, botanical sketches are very detailed and precise. These make for beautiful drawings and paintings, and we absolutely love them! 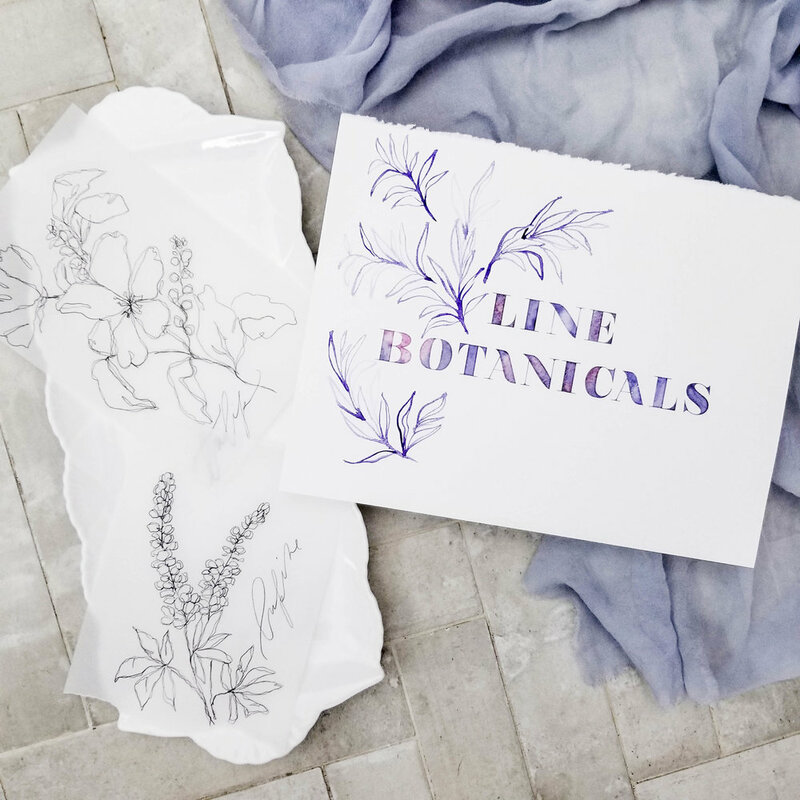 In this course, we will explore a more whimsical interpretation of line botanicals. Victoria has been doing a version of this style since her art school days, for everything from botanicals to anatomy. We'll be learning how to loosen up a bit and create botanicals with loose movement and imprecisions. She'll walk you through how to embrace imperfections in your piece and stylize your botanical drawings. We'll use both pen and brush to explore this style so you can see how it can apply to many different mediums. Next up for our Semester II courses, we have Time Management! As with all the other Semester II courses, registration will open on December 12, with class materials becoming available on January 13th! I had a client early this year who I deemed a nightmare - I told anyone and everyone about this client and how terrible the process was from start to finish. It really knocked my confidence. Now, with the benefit of hindsight, this wonderful bonus video, and some fabulous clients, I've been able to take a step back and reconsider... What could I have done better? Was I simply passing the blame to the client when I could have managed the process better? What steps have I take with the clients I have enjoyed working with and how do I implement that with new clients? All tricky and thought provoking questions! Thank you for challenging how we think as creatives, it's so refreshing being pushed to think more closely about business, client handling, and the design process." If you haven't already taken the first Watercolor I course, but think you might want an introduction or refresher in color theory, registration is still available for Semester I courses through till June 2017! Get in early for Semester II registration! We're opening up pre-registration for Semester II courses on Cyper Monday! Use coupon code 'cybermonday' and get 20% off all Semester II courses, including the Class Pass. Our second semester pricing course will dig a bit deeper into the world of pricing. We'll look at specific pricing examples in two industry categories: custom calligraphy projects and building a pricing sheet as a paper pusher (i.e. stationer). Pricing for custom calligraphy projects will include large scale quotes, wedding vows, family crests, large menus, large seating charts, etc. We'll talk about how to price your time as well as the cost of product for these situations in addition to building your pricing as a calligrapher and the different pricing structures that are available. The second example we'll get into is pricing paper, printing, assembly details, and your time as a stationer to cut down the time it takes to get quotes to clients and ensuring accuracy in your pricing. Following up our watercolor I course (color theory), we'll be moving in to more color mixing as well as understanding how different base shades mix together. We'll be mixing custom colors to match pantone or printed shades, perfect if you're a calligrapher mixing ink to match a clients invitation. Cyanotype printing, invented in 1842, originally had its origins in reproductions, specifically blueprints (hence the name) but also can produce gorgeous cyan or prussian blue prints. We'll learn about the process and create botanical prints! Following up our Sketching for Creatives and Establishing Your Creative Process courses in semester I, we'll be doing a course in design boards and how to utilize them in your own creative process to hone in on and communicate design scopes to clients. Further narrowing your creative process allows for less time doing the back and forth with clients as well as reducing the amount of time spent with too many ideas flying around. Design boards help both you as the creative, as well as your client, keep the end design goals in mind, stay focused, and work more efficiently. In a creative market, branding is king (or queen, but she's a hereditary queen, so the king doesn't outrank her. Theres a little monarchy humor for you). We'll look at how to go about branding your own company, how to define your brand style, define your market and how to brand for it, and how to design for yourself (we're our hardest clients!). We'll utilize design boards and sketching, working through our own creative processes.